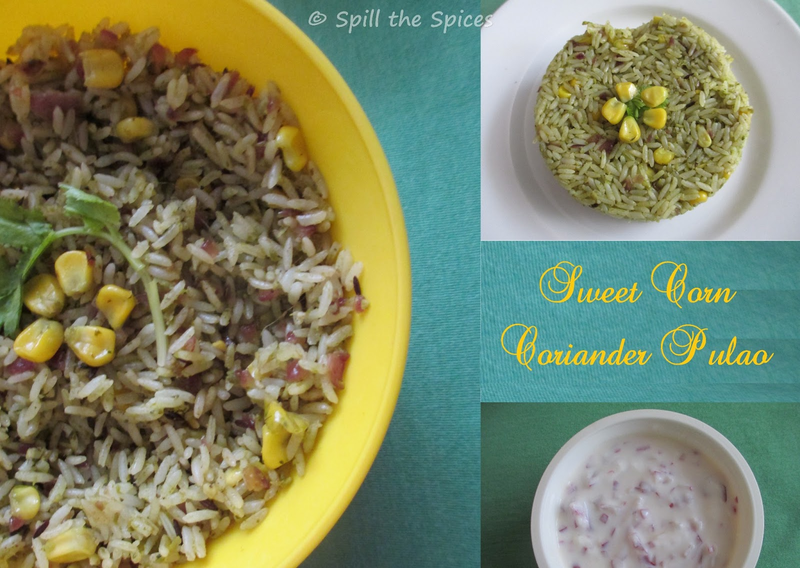 A coriander flavored mildly spiced pulao with the sweetness of corn. One-pot meal recipes are perfect for a quick and tasty lunch or dinner that has minimal clean-up and just one pot! They are ideal lunch box recipes for kids and working people. So why make time-consuming meals when you can prepare scrumptious meals in only one pot? 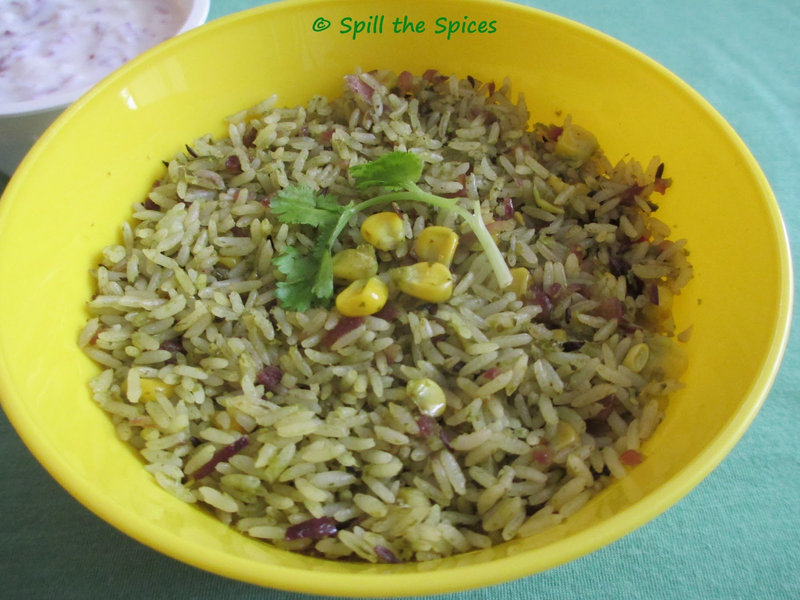 Corn coriander pulao is an easy, quick pulao and doesn't need lots of spices. The coriander leaves with green chilly-ginger-garlic is enough to give a nice and subtle flavor. The best combination for this pulao is onion raita and applam/pappadam. 1. Grind coriander leaves along with ginger, garlic, green chilly, coconut and tamarind paste to a paste without adding water. 2. Boil corn in hot water till it becomes soft or microwave it for 2 minutes. 3. Wash the rice and drain well. In a pan heat 1/2 tsp ghee and add cinnamon, cardamon and cloves. Fry till aroma comes. Add this to the rice and cook the rice. After the rice is cooked, spread it and allow it to cool. 1. In the same pan, add rest of ghee and add jeera. When it crackles, add onions and fry till they are golden. 2. Now add the coriander paste and fry till raw smell of the masala goes. 3. Add the corn, turmeric powder, cumin powder, coriander powder, garam masala, salt and mix well. Saute for 3-4 minutes. 4. Add the cooked rice and combine gently. Stir for another 3-4 minutes and remove from heat. Check out my other one-pot meals. Delicious pulao with sweet corn and coriander. Nice addition of corn to the pulao. Looks inviting. Very flavorful and healthy pulao. First time here, lovely post. Thanks for linking to my event. Love the flavor in the rice. Very colorful combo!! love it!! Great flavours in there :)Would love to try the pulao out. Looks delicious! Loved the combo of corriander and corn to.